Chromebooks are college-bound this fall. Introducing the Chromebook Lending Library. 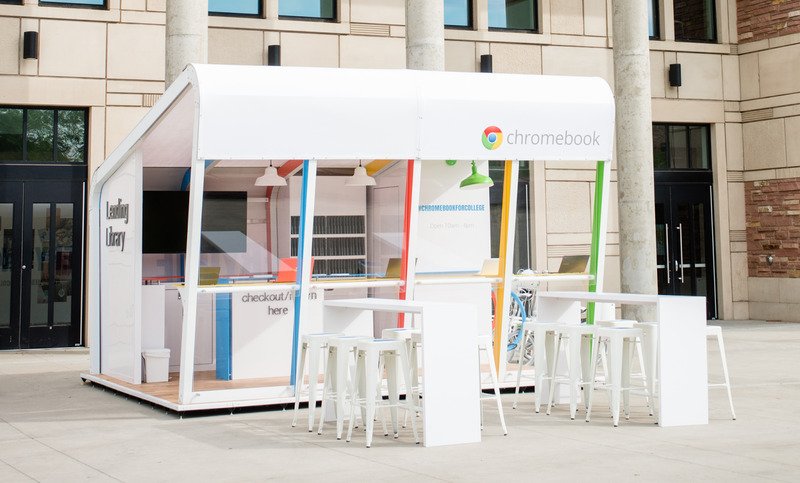 The Chromebook Lending Library is traveling to 12 college campuses across the U.S. loaded with the latest Chromebooks. The Lending Library is a bit like your traditional library, but instead of books, we're letting students borrow Chromebooks (no library card needed). Students can use a Chromebook during the week for life on campus— whether it’s in class, during an all-nighter, or browsing the internet in their dorm. Chromebooks are a new type of computer that helps students get things done faster and easier. They have the battery life you need to study all night and are light enough to slip easily into a bag or backpack. With Google Maps, Drive, and Gmail, important information is stored in the cloud, so students no longer need to worry about losing documents, pics, music, and more. The days of losing a paper are over! We hope you can swing by the Chromebook Lending Library for a little study break this fall. Check out chromebook.com/forcollege for all the details and spread the word with #ChromebookforCollege. And if the tour isn’t hitting your campus this fall, you can follow along on Twitter and Google+.